Researchers at the University of Tübingen have discovered a gilded mask on the mummy of a priest in Saqqara, Egypt. It is from the Saite-Persian period (664-404 BCE). 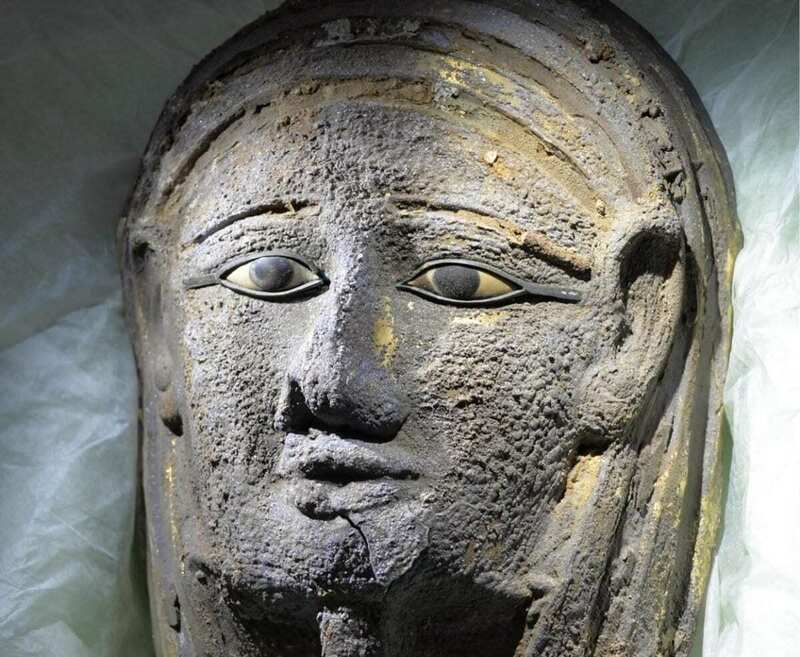 The head of the German-Egyptian team, Dr. Ramadan Badry Hussein, reported on Saturday that the mask was found in an extensive tomb complex which Tübingen archaeologists have been investigating since 2016, using the latest methods. The preliminary microscopic examination carried out at the Egyptian Museum in Cairo indicates that the mask is made of gilded silver. The eyes are inlaid with calcite, obsidian, and black gemstone which may be onyx. “The finding of this mask could be called a sensation,” Hussein says. “Very few masks of precious metal have been preserved to the present day, because the tombs of most Ancient Egyptian dignitaries were looted in ancient times.” Hussein added that the mask was found on the face of a mummy which had been placed in a wooden coffin, which was found in a badly damaged state. The coffin had once been plastered and painted with an image of the goddess Nut and still includes the name and titles of the mask’s owner. He is the Second Priest of the goddess Mut and the Priest of the goddess Niut-shaes, a serpent form of the goddess Mut; he lived in the 26th dynasty. “Ancient Egyptian funeral masks of gold and silver are extraordinarily rare,” says Professor Christian Leitz, head of Egyptology at the University of Tübingen. “We only know of two comparable finds from private tombs – the most recent one in 1939.” Even in royal tombs archaeologists have found only very few face masks of precious metals, he adds. Most of these masks were taken by grave robbers long ago and probably melted down. The tomb complex where the Tübingen researchers have been working is made up of several shaft tombs, some of them more than thirty meters deep. Over the top of one of the main shafts, the archaeologists found the remains of a rectangular building made of mud brick and irregular limestone blocks; it appears to have been a mummification workshop. In it they found two large basins which they believed were used for the natron to dry the body and in the preparation of the linen bandages to wrap it. Pots found in an underground chamber included bowls and measuring cups inscribed with the names of oils and other substances used in mummification. 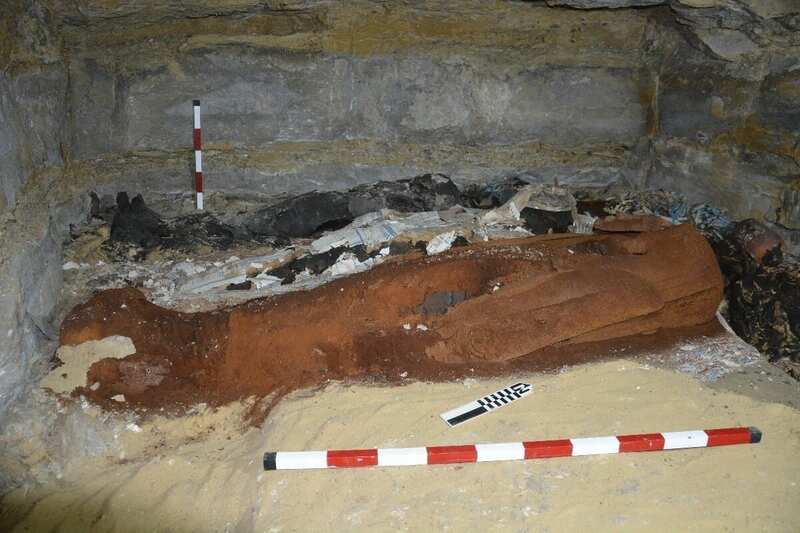 Tübingen archaeologists are using state-of-the-art technology in their investigation of the Saqqara necropolis. In the effort to document the entire complex, the University of Tübingen’s eScience Center, headed by Dr. Matthias Lang, is compiling complete, high-resolution 3D images of both the location and the key objects found there. A combination of laser scanning and image-based 3D processing makes it possible to visualize and analyze the shape and layout of the interconnected parts of the complex.